After last week’s little experiment, it’s back to regular Zombie Simpsons this week, including plots that don’t make sense, two clock eating montages, several unnecessarily self-voiced celebrities, the standard hacktacular ending, and plenty of characters telling us exactly how they’re feeling. As a sort of bonus, some of this week’s exposition is written down rather than spoken. The story here is – and stop me if you’ve seen this one a dozen times before – Lisa is sad. She goes to a therapist who tells her to do “art therapy”, which turns into a comic book that she writes and Marge draws, which turns into a Broadway musical, which turns (at long last) into the end credits. There isn’t really a b-plot this week, so they tossed in some random scenes of Bart and Homer doing brief sketch pieces. – No couch gag or title sequence, which means this one ran long, which is not a good sign, especially when the opening is Lisa having a dream that she narrates to us. – Waking up, Lisa runs into Homer and Marge’s room where, in the span of just thirty seconds, they manage to do the “Homer wakes up instantly” joke twice. Lenny: I only paid a student dentist twelve dollars for this brand new crown. [He pulls out his tooth.] See? Marge: I don’t think it’s supposed to come out. After this scintillating exchange, Homer looks at the family, then smiles and nods vigorously. This is funny, but not for the reasons the show wants. – They walk by Dan Harmon teaching a class. He gets pelted with spitballs and falls down. This is the first of many useless self voiced celebrities. – Homer tosses Bart into a dog grooming class because, hey, that’s funny. – We finally get to the therapist, who is clearly pregnant but who also tells us she’s pregnant. I swear they sometimes read the stage directions out loud and nobody notices. – Effort alert: there are a couple of book titles in the counselor’s office, the only one of which I liked was “The Social Psychology of Student Loan Debt”. But, hey, they’re kinda trying. Right? – The Bart-as-dog thing is still going on as Lisa struggles to draw her feelings. 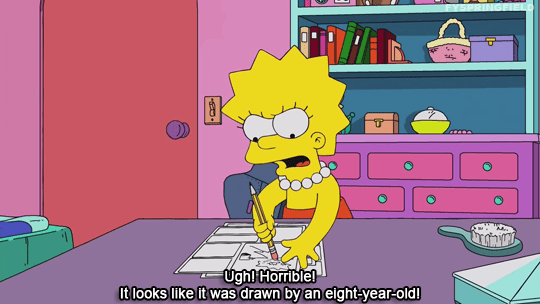 Then Marge comes in and draws Lisa’s feeling for her. 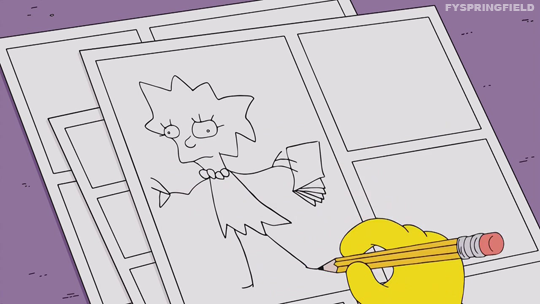 This leads to our first montage as Marge’s drawings of Lisa’s life are animated. This includes thought bubbles for this week’s distinguishing feature: written exposition. – This leads to a minute long scene that involves YouTube, exposition, a bear costume, more exposition, and then even more exposition until Lisa agrees to let them sell the book. Jebus, that took a while. – Lisa becomes famous, with random people in the supermarket asking for her autograph and Mel shouting out the word “zeitgeist”. This leads to our second montage, which is accompanied by a one-word substitution “parody” of the old Rod Stewart song “Infatuation“. The credits will later inform me it was sung by Kipp Lenon, a/k/a the guy who did the singing for Michael Jackson back in Season 3. There’s your trivia moment for this one. – After the montage, there’s a Homer and Bart sketch that uses the Andy Griffith Show theme song. That is all. – Moving the plot along to a comic book festival, we get a women-in-art panel discussion with Marge, Lisa, and three self voiced celebrity writers/cartoonists. This takes a while and ends with Marge being jealous because all the questions are for Lisa. No, it doesn’t make any sense. – Later, Marge wants to write her own comic, gets in a fight with Lisa, and then Martin Short shows up doing a half hearted impression of the voice he does on the PBS version of Cat in the Hat. He’s playing an “impish genius” who wants to turn the comic into a musical. I know he’s an “impish genius” because they tell us twice. – A big part of what they think works here is recitations of previous shows this guy did. Lisa says he did a “Waiting for Godot” where Godot showed up, and an all dogs version of “Cats”. There’s gonna be like four more of these, all recounted seemingly out of nowhere. – The Homer-Bart sketch interludes continue with Homer now thinking he’s going to be rich. I will update you as necessary. – Lisa flees back to the therapist, who now has a crib that she’s gently rocking. Remember, she was pregnant and they told us so. Now she obviously has a kid and they will tell us that as well. The need to make even the most obvious things explicit is among the seven or eight most annoying tics of this show. – Homer is now planning to get a sail boat. – The show finally starts and it’s basically montage #3, with lots of music and crazy stuff happening because wordless musicals are a good way to eat time. – After one final scene of Martin Short yelling and explaining things, the music devolves into chaos and the audience flees. – And we end at a bar where everyone is drinking and Marge and Lisa exposit their reconciliation. The numbers are in, and thanks to a late Packers-Cowboys game, 5.25 million people saw Lisa be sad and felt the same way. Remember, ratings are meaningless and no one in charge of anything knows what they’re doing. I’ve seen Kipp Lennon perform live! He was one of the backing vocalists on Roger Waters’ “The Wall” tour. Beats anything this episode had to say. 3 They clearly don't care anymore. 3 montages? Must be a record. So that Ghosted show is alright. It’s a dumb idea for a show but Adam Scott and Craig Robinson make it work because they are so damn charming and play off each other really well. Lisa being sad has been done a “dozen” times before? I think it is more like 159 times before. Ugh, don’t give them ideas. Remember when this show didn’t used to be “Family Guy”? Bart, go easy. I’m your dad! huh? when did CBG got married? !